Meltdowns are often caused by sensory issues. The world is often too loud, too bright, too stinky, or too silent. Even if a meltdown is triggered by something else, adrenaline will heighten our senses more. This is a natural survival instinct, but people with autism go into survival mode more often. This leads to a constant battle with confusion, adrenaline, and the senses. There are a few steps that you can take to help your child calm, using sensory processing as your starting point. If people’s senses are telling them they are in danger, they will become stuck in a loop of fear and adrenaline. By changing the sensory input and making an environment suitable, it is possible to interrupt this cycle. The world is very chaotic, and a busy environment creates a lot of information for the brain to process. This can trigger a meltdown when we can’t keep up. By reducing visual input, you can take the pressure away. If you have lots of books or toys lying around, invest in closed boxes. It is easier to process the sight of a single box and lid than a bucket with a hundred colorful toys. We are all adults with tons of paperwork, but try to keep it out of sight, so that your table or counters are clearer. Decorate with one or two colors in each room and pastel tones. A bright rainbow may seem appealing but becomes overstimulating when mixed with all that adrenaline. Keep your lights yellow with low wattage to reduce eye strain. Dim the lights or draw the curtains when a meltdown begins so that your child’s eyes can relax. If your child has sensitive hearing, a silent room could be filled with noise. I have autism and can hear the electricity and pipes in the walls and the buzz of power outlets. If you notice your child is very distressed in certain rooms, consider trying different lightbulbs and switching off plugs at the wall to reduce the buzz. It is a droning noise that penetrates the mind. 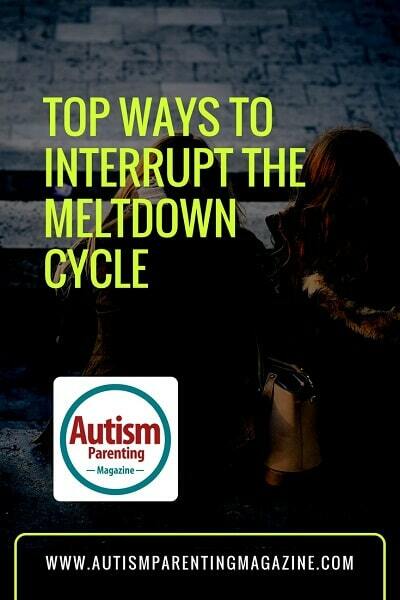 When a meltdown ensues, make sure everything is as quiet as possible. Shushing and murmuring can be booming for us. Seriously, be silent if possible and invest in ear defenders for your child if they are useful. Learn basic sign language to talk to any other carers. Creating signs for “help,” “swap with me,” and “stay back” will help you communicate without saying words. When your child is in a meltdown, he/she can’t understand much language, but the pressure of language creates more panic. If you need to talk, use single words or simple phrases. Keep your voice low; high pitches are louder and more painful. Don’t use shushing sounds; they are deafening to noise-sensitive people. Give instructions one step at a time. Use visual images to communicate important instructions. Even if your child is verbal, the ability to understand and use spoken language will be impaired when he/she is having a meltdown. I am a 25-year-old postgraduate student, and when I have a panic attack/meltdown, I can’t understand spoken language or use it. If your verbal child is able to use a few basic signs, he/she may find it easier to ask for help during a meltdown. Scents are very closely linked to emotional memory. People who are sensitive to smell will have a hard time tolerating anything too strong, but they may also have favorite smells that can be used for calming. You could have a special pillow with the child’s favorite scent on it for him/her to squeeze, scream into, or throw during a meltdown. This is a safe item that can have a calming effect no matter how it is used. Try to keep your house free of strong smells so that your child’s brain is not consumed by trying to identify and ignore various scents. If you cook, open a window. Clean and wash with unscented, nonabrasive cleaners. Taste is often forgotten during a meltdown because this is not really a safe time to eat. However, taste can be a useful sensory aid to help us calm down. Having a favorite treat on hand after a meltdown will help a child rebalance the sensory system. There are also some flavored chews available, which might be a good alternative during a meltdown. I have very sensitive touch, and when I go into a meltdown, my skin is very painful. It feels like it is on fire and my clothes, which normally feel like a thousand ants, are suddenly like fuel to the flames. If your child is stripping off clothes, it may be worth finding a safe place for him/her to wear less clothes until the meltdown ends. This could be a disabled toilet, his/her bedroom, or a den. Try not to touch your child. When I have skin contact, I can feel an energy emanating from the other person’s skin that is hard to tolerate. It feels like electricity! If you have to touch your child to keep him/her safe, keep your grip firm and safe. A light touch will increase the friction and energy between you. Try to hold the child over the clothes or wrap a blanket around to reduce this input. Remember, it is not you but the energy you emit that the child can’t tolerate. This sense is important but often forgotten. Proprioception is the feedback that people get from their muscles. It allows you to know where your limbs are, what your body is doing, and how hard to close a door. Children who walk heavily or slam doors accidentally may have under-sensitive proprioception. During a meltdown, this translates into a craving for muscle feedback, such as throwing, hitting, banging, and biting. These behaviors need to be fed because the child is communicating a sensory need, but they must be converted into safe behaviors. You can give your child a room (perhaps his/her bedroom or playroom) where he/she can throw a pillow or teddy without breaking things. If the child has a special interest, buy a teddy from that brand or genre and get the child to throw it around or squeeze it. The interest will have positive associations and the child will feed his/her proprioceptive system with the actions. Hitting and bodyweight can be converted into deep pressure. Biting can be satiated with soft toys, food, and chew aids. When my proprioceptive system goes into overload, I am so tense that my body experiences a lot of pain and muscle fatigue, but I have no control. By using deep pressure, I am able to help my muscles relax. A squeeze, weighted blanket , or tight wrap will provide the muscle sensation without the tension. If your child can not sit still during a meltdown, intense activity such as running, jumping, and pushing against a wall will do the same job. Get to know your child’s sensory profile. Make notes, talk to other people who care for your child, and notice his/her stimming behaviors. Your child’s behaviors will give you an insight into his/her mind. Look for what the child seeks and pushes away. These are equally important. By writing down different things that he/she likes and dislikes, you can make a list of what to use and avoid during a meltdown. Make a calming kit. This will be your toolkit to use during a meltdown. Give your child aids that can help him/her one by one. If you see the child biting, give him/her a chew. If you see the child hitting, give him/her a teddy. Remember that techniques like deep pressure and sign language are in your toolbox too. Use these aids when the child is calm, so he/she understands how to use them during panic. Meltdowns are stressful! You deserve to chill out, so make yourself a calming kit too. You can use them together. This will normalize and model the behavior that you want your child to do. Your child might prefer your kit to his/her own, so make sure it is all safe. When a meltdown ensues, do a quick sensory checklist. No matter what the stimulus was, you need to make the environment as calm as possible. Close the curtains or lower the lights. Turn the volume down on everything. Step back. Be quiet. Have as few people in the room as you can, while being safe. If you have a den or room to take your distressed child to, do it. Grab your sensory kits. Ride it out with your child. Note what works, in case you need to change something next time. Anika Smith is a linguistics student and teaching assistant for children with autism. She lives in England with her son, Noah. Anika was diagnosed with autism at the age of 14, after a tumultuous diagnostic process. Noah is six years old and diagnosed with autism too. They journey together.